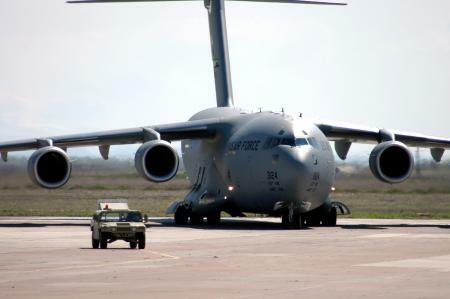 With one year left on the agreement between the U.S. and Kyrgyzstan to use the Manas Transit Center, speculation has emerged that the U.S. military might be looking for bases elsewhere in Central Asia. One possibility is Uzbekistan, a vital link in the Northern Distribution Network that will become even more important when NATO starts moving troops and supplies out of Afghanistan, according to The Associated Press. “We will soon hear about how Uzbekistan has entered into a new strategic alliance and granted its territory for U.S. military bases,” Vadim Kozyulin, Central Asia expert at the Moscow-based Russian Center for Policy Studies, was quoted by The Associated Press as saying. Meanwhile, a Russian media outlet is reporting that the U.S. is also cozying up to Tajikistan. But a Defense Department spokesman dismissed such speculation. “There are no plans to open a U.S. military base in Tajikistan or Uzbekistan,” Cmdr. William Speaks said in an email. Speaks would not comment on whether the U.S. may stay in Kyrgyzstan when the agreement between the two countries ends in July 2014. “We do appreciate the support of the Government of the Kyrgyz Republic for coalition efforts in Afghanistan and its commitment to regional security,” he said.